The Quilting Nook | Where I share my quilting and crafting journey! Hello Everyone! Today I finally get to share the Timber and Christmastime Collection for The Art of Home Club by Jacquelynne Steves. The planning for this collection started in October 2018 when Jacquelynne asked if I would like to design a couple of The Art of Home collections for this year. It was fun working with Jacquelynne on the main quilt design until we got it just right. Jacquelynne sent me the silhouetted appliques, but I designed the Quilt Center Applique and the embroidery blocks. (Okay, it’s the same design, just on different scales). This post will be heavy on pictures, but I hope you will enjoy them. Jacquelynne sent me a few of hers to use, too. Thanks, Jacquelynne! I love, love, love The Timber Quilt. I have always been partial to cabin style décor and at one time, my husband and I entertained owning a cabin in retirement. This quilt would be perfect for a mountain or lakeside home or cabin, or just because you like the outdoors. It would also be perfect for those male members of your family, whom it’s always hard to find patterns and fabric for. This is a largish quilt, 66″ x 76 1/2″. It just fits on the top of my daughter’s queen size bed. The buffalo check plaid is easy to sew, but you need to make sure that your blocks are sewn correctly or you will loose the affect. The same thing with the bear paw blocks. Easy to sew, but turning them correctly matters. The pattern has clear step by step instructions for making both blocks, but you must be a Club member to have access to them. I have also provided the materials list for the fabric and floss for the collection if you are interested. You can find it on my tutorial page here. This quilt would make a great Christmas quilt with the appliques shown or substituting some of the other appliques provided. The pattern includes a wide variety of the silhouette appliques that can be used in the quilt, wall hanging or pillow. I really had fun designing the center applique. It went through many iterations before this one. I originally had mountains in the background, which I liked, but thought that would be a little too much. I decided to keep the design simple and basic, using mostly one piece appliques. I think I struck the right balance, I hope you do, too. I took the design of the Quilt Center Applique and reduced it so it could be used for embroidery. The center is large and even though you could embroider it, I think it looks better on a smaller scale. Here, I turned the Timber quilt into a Christmas Wall Hanging. There are just so many options with this collection. Instead of making my own buffalo plaid, I bought it. There are several collections now that have it. This one is from Hearthside Holiday by Deb Strain for Moda. The applique was fused then sewn using a buttonhole stitch on my machine. In the quilt, I used a very small stitch with matching thread so it doesn’t show. As a design element in the wall hanging, I used a contrasting thread and made the stitch just a little larger. I also added the buttons as an extra detail, but only after I finished quilting. You could also use a black (or red) work style of embroidery and use it as the center of the wall hanging or the pillow. I haven’t used the moose embroidery in anything yet, but I think I will make another pillow and use it in our camper. This is the pillow with a combination of appliques. Again, the pattern is very versatile. All of the Quilt Appliques will fit in the pillow or wall hanging center block. You can also make a small table runner instead of the pillow. I love the pillow and it looks great with the quilt. My husband has already said that the pillow will go to the camper. I was thinking maybe the quilt would too, but then I would only get to see it about once a month. Well, I think I used all my pictures! I hope you like it as much as I do. There are so many “cheap” cabin style quilts that you can buy, but this pattern allows you to make just the right one for you. All the quilting was done by me on my Pfaff QE 4.0 domestic machine using Aurifil thread. For the straight line quilting, I used my ruler foot and rulers with the machine set in free motion mode. For the quilt, I used Quilter’s Dream Wool batting which gives the quilt a beautiful loft and feel. The wall hanging and pillow have Quilter’s Dream Select batting in them. If you would like to become a member of The Art of Home Club, sign up here so you can be notified when the club is opening for new members again. There are several payment plans, but for around $10 a month, you get at least three new patterns every month, plus bonus patterns throughout the year. It really is a good deal. This image shows the red and black print the best. You can use any coordinating print for the plaid, just as Jacquelynne did with her Pink quilt. I hope you enjoyed the Timber and Christmastime Collection. I certainly had fun making it. Thanks for stopping by and Happy Easter! Hello Everyone! I have a fully finished cross-stitch project to share today. But first, have a look at my beautiful azaleas and pretty bluebells and Lenten Roses. Most of the azaleas were about 3 to 4 feet tall when we moved into this house 20 years ago. They’ve been trimmed significantly twice and probably need another good trim. We’ve had so much rain this year that they are in full bloom and beautiful. I finished Welcome Summer by The Drawn Thread last week. It was a fun stitch with enough variety of stitches to keep it interesting. I just love that bee skeep with the long stitches and the geraniums. The linen is 32 count Star Sapphire by Wichelt that I purchased from my local Quilt Shop, Tiny Stitches. The shop carries a nice selection of cross-stitch products, too. The called for threads were all Dinky Dyes Silk. I substituted all my threads with The Gentle Art Simply Shaker, Classic Colorworks, Weeks Dye Works and DMC. If you are interested in the threads I used, you can email me and I will send you a copy of my conversions. I used a combination of Vonna’s and Priscilla’s method for finishing. I used Vonna’s mounting technique for the cross-stitch and fabric covered mat board and Priscilla’s finishing technique of adding the finished piece onto another item. In my case, I used a plaque that I purchased from Michael’s. Check out both of their blog and Flosstube channels for inspiring finishing techniques. I couldn’t find a specific tutorial for using the magnets and washers, but from watching Priscilla and other flosstubers on YouTube, I think this is the way she does it. Welcome Summer is currently sitting on a tea table in my foyer. I can also hang it, but haven’t found a place yet, because most of my wall space is covered with quilts or pictures. I have four other Welcome charts by The Drawn Thread that I will exchange for the seasons. I will start working on the Autumn one soon. Currently, I’m working on Home of a Needleworker Squared and I think I will finish it before moving on to Farmhouse Christmas again. It’s stitching up quickly. I also finished Step 4 for the Sew Your Stash Along. I really like the stars made with Sweetwater’s Project Red fabric from a layer cake. I have started Step 5 and will hopefully finish that by the end of the month. I’ll be back on Saturday to show you the Cabin Collection for The Art of Home Club. I’m so excited that I finally get to share it. Jacquelynne took some great pictures, too. Thanks for stopping by! Hello Everyone! I have a very busy couple of months ahead of me with family events and sewing commitments (mostly self-imposed). To help keep me focused, I sat down and planned out through June, and actually wrote down dates I want to have certain tasks for each project finished. I don’t usually plan that much detail so we’ll see how it goes. Today, I thought I would share what I’ve been working on and what’s coming up that will keep me busy. First, though, how about a pretty rainbow seen from my front porch a couple of weeks ago. This is probably one of the prettiest and long lasting rainbows I’ve seen at home. If you look carefully, you can just make out the second rainbow above the main one. Maybe next week, I’ll have some azalea’s to show you. They are just starting to bloom and with all the rain we’ve had, it looks like they are going to be beautiful. Now for what I’m working on. I’ve been making star blocks for the Sew Your Stash Along guild project. You can find the instructions and Diane’s (Butterfly Threads Quilting) version here. She used rail fence blocks, but I wanted something different. I had a layer cake of Project Red by Sweetwater (in my stash) that I thought would work. You can see my quilt through Step 3 here. My only concern is that these are a little more muted colors than what I already have. I plan to balance these out with the fabrics I’ll use in Step 5. I’ve also spent a lot of time quilting my 2017 Moda Blockheads 1 quilt. I’ve quilted feathers in the sashing and ribbon candy in the inner border. I plan to quilt feathers in the outer border and then will use my ruler foot to quilt some curved cross-hatching in the setting triangles. I put this quilt aside last November after quilting all the blocks to finish up my Holly-Daze quilt and Winterville quilt during December and January. I’ve entered the quilt in our local quilt show, Georgia Celebrates Quilts, and I’ll find out at the beginning of May if it’s been accepted. I’ve also spent some time working on the design for The Art of Home August Collection, which will be Halloween themed and a wall-hanging as the main project. The design is finished and I’ve started working on the applique pieces. On April 20th, I’ll be able to share the Cabin Collection that I designed. In the late afternoons and evenings, I’ve gotten in some stitching time almost everyday. I finished the first half of Part 1 of Jack Frost’s Tree Farm. I made some thread changes to the white (DMC 3865) and to the sign. I used DMC 3866 for the sign and Classic Colorworks Cherry Cobbler (instead of Black Coffee) for the lettering. I decided Part 1 would have to be a two month stitch and I’ll start Part 2, Douglas Fir in May. …Home of a Needleworker Squared, also by Little House Needleworks. The chart and floss came as a kit from Fat Quarter Shop, which has embraced the new cross-stitch movement. If you like to cross-stitch, check out some of their selections. They also have very quick shipping. My nephew will be graduating from high school in June, so he needs a quilt. He is number 6 out of 7. My sister said he likes blue, so blue it will be. I found this Waterfall jelly roll by Kona and will use a Jr. Jelly Roll of Moda Grunge White Paper for the accent. The pattern is Low Voltage by Kari Nichols of Mountainpeek Creations. I found the pattern at my local quilt shop. I laid out and numbered the strips. I think it will be easy to cut and sew, but keeping the strips in the right place will be critical for the look of the quilt. I’ve never made a graduated color quilt before, but I think it’s going to turn out awesome. The pre-cut strips will make it go quickly, too. It’s time for Jacquelynne Steve’s free BOM again. You can visit Jacquelynne’s site and sign up for her newsletter so you’ll know when to sign up for the BOM. The patterns will be emailed to you starting the first Monday in July if you want to join in. Jacquelynne will be opening the club again for new members soon, too. To find out more about the club, visit here. I will again be a featured blogger for the BOM this year and I have something different planned. I will be using Sunnyside Up by Corey Yoder for Moda for my project. Also, notice the DMC thread pack. Corey curated it for Fat Quarter Shop and it will go well with Sherri and Chelsi, Bonnie and Camille and Fig Tree fabric lines, too. My plan is for this month is get started on the embroidery for the Halloween Collection and the BOM. I may not be able to do as much cross-stitch as I’ve been doing in order to work on the embroidery. We do have two trips planned, too. My husband and I are going camping for a few days later this month, then in May, my daughter is graduating and we plan to spend a week at the beach while we are in Pensacola. We are really excited about the graduation and beach trip. It’s also yard work time of year. Last week I put down 45 bales of pine straw and over the next few weeks, I’ll replant my containers and get my perirenal beds in shape. So, busy, busy, but better than being bored. Also, I have the Minis and More project to think about. This month’s theme is flowers if you would like to join in and make a mini. Once you make it, you can send a picture to Sherri or Michele to be included in the parade at the beginning of next month. I think I have something in mind, but not 100 percent yet. I’ll let you know next time what I’ll be working on. I hope you have a great week and thanks for stopping by. Hello Everyone! It’s time to share the table runner I made for the Minis and More Parade. Sherri and Michele gave us a spring theme last month and as I had cut fabrics for a table runner from Garden Variety fabrics by Lella Boutique for Moda, I thought it would be perfect for this month’s parade. I used Camille Roskelly of Thimble Blossoms Round and Round Mini pattern to make the runner. As you can see, the original pattern is for an 11″ finished mini. I made three blocks, three blocks with lots of pieces! You can read more about the construction of the blocks here and here. The Garden Variety fabric came in a Sew Sampler Box. The blocks are made from a charm pack (from the box) and White Moda Grunge. The blue border fabric was also in the box. I do have a construction tip for you: don’t cut the sashing until your blocks are made and trimmed! I know this, but did I do that on this one? No, and guess what, my blocks measured just shy of 9 3/4″ square. And they were all the same. I had already cut the sashing to 9 1/2″ and needed the rest of the fabric for the borders. So, some of the outside star points are cut off. Oh well, I won’t be cutting sashing before blocks are made again. I played around with the quilting quite a bit. I used a Fixion Pen because the fabric was light. I would never use it on dark fabrics because it leaves a ghost line when removed. The center square motif was a combination of designs from Quilting Made Easy by Eva K. Larkin. I’ve had this book for a long time, but have only used the designs a few times. I ironed away my test markings and remarked the blocks for quilting. Because I wanted to quilt this quickly, I marked the continuous curve lines in the stars instead of using my ruler foot. I like how the feathers on the outside accentuate the circle of stars. I contemplated a small quilted filler inside the circle, but thought that too much quilting would be out of proportion for the rest of the block. Instead, I quilted the continuous curves from star point to star point, then quilted about 1/8″ around each star. The inside border is quilted with a wavy line and the outside border is quilted with a double figure eight. The double figure eight still needs some work, but on the dark, busy fabric, it doesn’t show much. All the quilting and piecing was done with Aurifil 50 wt thread. This is the matching Pinny from last month’s Minis and More Parade. This table runner is going to be a nice addition to my spring décor. I hope you enjoyed the parade this month and will consider joining us next month. Be sure to visit Sherri and Michele to see the rest of the parade and find out what next month’s project is. Hello Everyone! Today I want to share a tutorial for making a vinyl project bag. 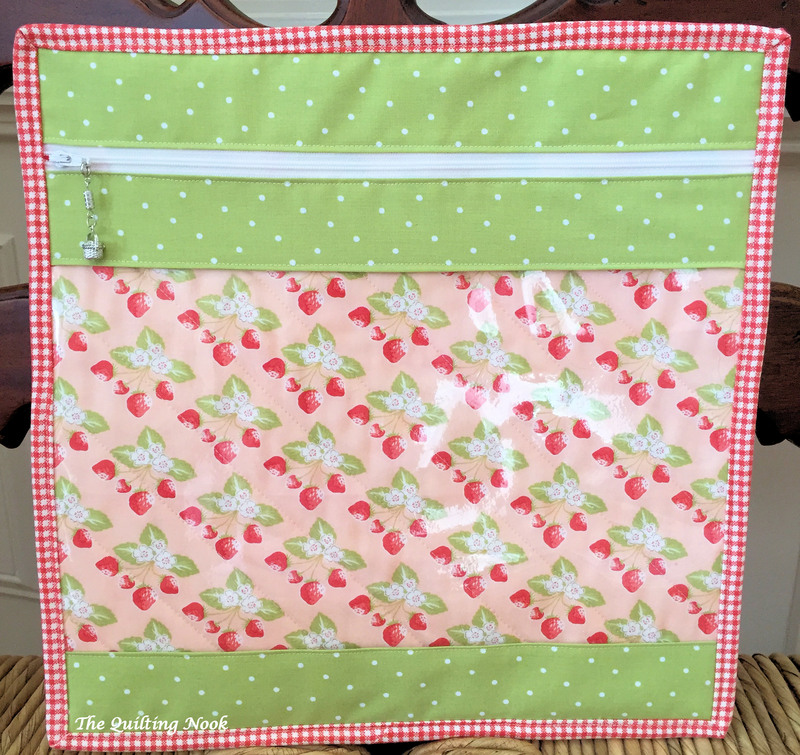 These bags are not just for cross-stitch projects, but can be used for embroidery, applique, English Paper Piecing or holding your finished quilt blocks. You can read more about the origin of the bag here and with links to YouTube tutorials with similar bags. I added quilting, accent fabric and binding. What can I say, I’m a quilter, the more fabric the merrier! If you have no interest in making your own bag, but would like to have one for holding your project, I’ve made four and have added them to my Esty shop. These are just a trial to see if they sell. If they do, I may add 4-5 every two to three weeks. They are a great way to use some of my fabric stash. Now for the tutorial. My bag measures 13 1/2″ x 13 1/2″, but you can make it any size you need. Fabric Requirements for 13 1/2″ x 13 1/2″ bag. Zipper – 16″ or longer. I like to use the zippers found in quilt shops because they have a little wider zipper tape than the ones found at Jo-Anne’s or Hobby Lobby. ** It would be helpful to use clips (such as Clover Clips) to hold bag pieces in place. Step 1: Cut front and back one 1″ larger than bag size, for my bag, 14 1/2″ x 14 1/2″. Fuse interfacing to wrong side (WS) of back fabric. Step 2: Lay back right side (RS) down, interfacing side up. Then lay batting on top of back, then lay front fabric on top of batting, RS up. Step 3: Quilt as desired. There needs to be just enough quilting to hold the layers together. Think about using one of your decorative machine stitches as your quilting. Step 4: Trim quilted piece to desired size, 13 1/2″ x 13 1/2″ for my bag. Step 5: Fold each accent piece in half wrong sides together (WST) and press. Step 6: On one accent piece, fold each raw edge under 1/4″ towards WS and press. Step 7: Lay the zipper RS up on a table with the zipper tab to the left. Place one accent piece on top edge of zipper tape and accent piece with 1/4″ folds on bottom of zipper tape. The folded edges should be next to the zipper as shown above. Use the lines on the zipper tape for guides to place the accent fabric. Pin the accent fabric in place on the zipper tape. Step 8: Using a zipper foot if necessary, edge stitch the folded edge on the zipper tape for both the top and bottom. Step 9: Place the zipper unit at the top edge of front unit and last accent piece along bottom edge with raw edge of accent piece on the bottom. Clip in place to hold. Measure from 1″ above the bottom of the zipper unit to the bottom edge of front. Step 10: Cut vinyl to width of front and height from Step 9 measurement. For my bag, cut vinyl to 13 1/2″ x 10 1/2″. Step 11: Place vinyl on top of the front, lining up both the bottom and side edges. Center the accent piece on top of vinyl. The accent piece will be slightly wider than front and vinyl. Clip bottom of vinyl and accent piece together. Remove from front and pin in place on top of the accent piece for extra security. Step 12: Edge stitch along folded edge of accent piece and vinyl only. Leave raw edge unsewn. Step 14: Place top edge of vinyl between the bottom, pressed edges of zipper unit. Re-adjust vinyl if needed to make sure bottom and sides of vinyl unit are still lined up with front and vinyl lays flat. Clip edges to hold in place. Zipper unit should slightly hang off each edge. Pin vinyl to zipper unit only. Step 15: Edge stitch along 1/4″ pressed edge of zipper unit, making sure to catch back edge. Step 16: Place vinyl/zipper unit on top of front, lining up vinyl on side edges and raw edges of accent pieces on top and bottom. Clip around all edges to hold the units together. Open zipper part way as shown. Step 17: Sew 1/8″ around the edge of the entire bag. Step 18: Trim all edges, cutting off excess zipper and accent fabric. Step 19: Make binding. Sew binding to back of bag, using 1/4″ seam and mitered corners. Step 20: Fold binding to front and clip all edges, mitering corners. Stitch edge of binding to front, keeping zipper open. *If binding needs to be pressed, press from back. Vinyl will melt! Let me know if you have questions or problems with the directions. If you make this bag, please give me credit and link back to this post. Tag me on Instagram, @thequiltingnook, #thequiltingnook. These are two smaller versions of the bag I made for my daughter. The construction is the same, you just need to adjust the sizes. Hello Everyone! I’m back today for an update on my cross-stitch activities. If you missed yesterday’s post, that was all about quilting. I decided to divide my posts up so neither would be too long. Let’s get started with Farmhouse Christmas by Little House Needleworks. I finished the center square, but did change some of the colors. I substituted CC Pebble Beach for CC Pine Needles and changed the green border from CC Weeping Willow to DMC 470. This was a fun block to stitch, especially being a quilter. The Ohio Star block is probably one of the most popular quilt blocks in traditional quilting. It would be fun to duplicate this as quilted table topper for Christmas, including the center snow flake, hmmmmm! You can see the Weeping Willow green in the Baa Baa Black Sheep block. It shows up better in the picture than in person. I’ll be taking it out in that block and replacing it with the DMC. I plan on playing a little Tic-Tac-Toe and will start on Block 1, Little Red Barn, next month. If you would like to see unique version of Farmhouse Christmas, watch this Country Stitchers Flosstube #46. Deb shows her version with all the charts laid out in one row. It is stunning! It’s about 15 minutes into the video, but if you can watch the whole thing, Deb and Liz are fun to watch. After finishing the Farmhouse Christmas block, I went back to Welcome Summer by The Drawn Thread. I worked on the E, L and C. The flag was lots of fun to stitch, but I have to tell you, the leaves on the watermelon vine were a chore. I am using all substituted threads on this one and working 2 over 2 on 32 ct. Sapphire Linen. On the watermelon blossoms, I worked those 1 over 2, but used 2 over 2 for the leaves in a satin stitch. I had to work each one of those at least twice. On the last one, I finally took the piece and of my hoop and stitched in hand and that helped. I made a new project bag over the weekend using Nancy Halverson’s Home Grown Fabric by Benartex. I plan on having my tutorial for making these bags next week so you’ll see more of it then. I also got in a little haul. (Can you tell I’m trying to speak Flosstube lingo?) Anyway, I picked up Welcome Autumn, also by The Drawn Thread and Liberty Dwells by Brenda Gervais of With Thy Needle and Thread. I think I now have all the Welcome’s except Spring. I also really like the star pillow. That’s cross-stitched, not fabric. I am going to try to stitch that for a summer project. After finishing the “C”, I put Summer Welcome aside and started back on Jack Frost’s Tree Farm, also by Little House Needleworks. I had stopped earlier on this one because I didn’t like the called for floss for the snow on my fabric, which I changed to 32 ct Lambswool. I tried several different colors and decided that DMC 3865 worked the best. Michael’s only had one skein, so I’m going to have to go back and get a few more to finish all the charts. The charts are being released a month at a time and I am waiting for my next one. I signed up at Traditional Stitches to get each piece every month. Part 1 came with the fabric, floss and first chart. What I didn’t realize when I signed up is that Traditional Stitches is in Calgary, Canada. As it turns out, with the exchange rate, it’s costing a little less than if I got it in the US, but the shipping time is a little longer. I’m not ready for the next one anyway, so a few extra days won’t matter. So that’s where I am with my stitching. I plan on finishing Part 1 of Jack Frost’s Tree Farm before continuing on to something else. I haven’t decided what’s next however. In the mean time, I’m getting back to quilting my 2017 Moda Blockheads quilt because I plan to enter it in the local quilt show. Hello Everyone! I hope you are having a great weekend. It’s been beautiful here and soon the pollen will be out and we won’t be able to enjoy some of the best temperatures that we have. It’s like this every spring, the screen porch gets so much pollen on it, that it’s hard to keep up with wiping it down until the pollen season is over. We can sit on the deck, but you may have a thin layer of pollen on you when you come in. Oh well, it only really bad for 2-3 weeks. It’s been about a week and a half since my last WIP update and I have a few quilty things and cross-stitch things to share. So this post doesn’t get too long, I’m going to divide it into two posts, quilting and cross-stitch. Even if you are not a cross-stitcher, I hope you’ll still enjoy reading and looking at all the wonderful designs that are available now. I finished Step 3 in the Sew Your Stash Along that I’m participating in with my guild. The design is by Diane Knott of Butterfly Threads Quilting. I love using my red, blues and creamy white fabrics from my stash. Diane provided a coloring sheet to go along with the sew along and you can see that I’ve been using it to try different colors and designs. I’ve started Step 4, but I’m deviating from Diane’s design on this one and will be making star blocks instead of strip blocks. I used most of my Project Red layer cake by Sweetwater to cut the pieces for the blocks. The fabric is coordinated and the squares for the star points are all marked, ready for sewing. I hope they will look as good on the quilt as in my mind! Earlier this week, I needed something to sew because my star blocks weren’t ready yet, so I picked up my Cheddar and Indigo blocks that were ready and laid out (and have been for months). I finished three more of these in a couple of days. It’s nice to have a project ready to go, just in case you find yourself wanting to just sit down and sew. I’m going to lay out the next three swoon blocks and I will try to work those in with star blocks while I’m sewing those. This week was shop hop in our area. I only made it to three of the shops, but that was plenty. I think I’m having a thing this spring for yellow fabric. I will have to make something with these fabrics soon before the mood passes by. As you can see, I also got more red and blue fabrics. I don’t know if I can use them in my quilt or not. A few pieces may find there way into it though, wink – wink. This week I also got the March Sew Sampler Box from Fat Quarter Shop. This month’s box included the new Chantilly fabric by Figtree and a new pair of scissors. I started this subscription in July, and overall I’ve liked the fabric and notions in most of the boxes. Last month’s (which I didn’t take a picture of) wasn’t one of my favorites because the fabric was really bright and more on the modern side, but I will try to find a way to use it or give it to the guild and they can use it for a giveaway. Yesterday, I had my quilt holders hold my 2017 Moda Blockhead quilts so I could get pictures. I’m not finished quilting it yet, but I hope to enter it in a local quilt show, Georgia Celebrates Quilts, in June. I need to send pictures and didn’t have an overall of this one. My plan is to start quilting again this afternoon. One of my hold ups has been how to quilt the sashing strips. I have a plan for the outer triangles and borders, and I now have a few ideas for the sashing. I will have to see which one works best. I also finished the Round and Round table runner, but will use it for the Minis and More project this month. I’ll share it around the first of April. Have a good week and thanks for stopping by.